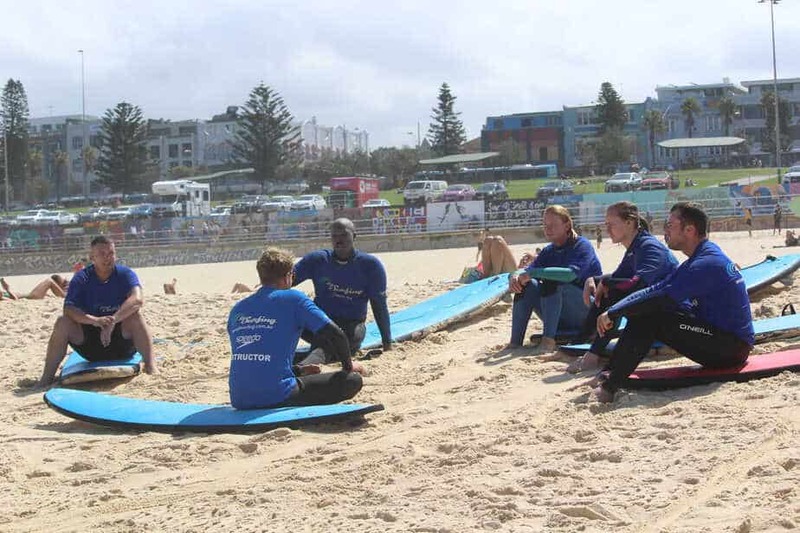 We Went Surfing at Bondi Beach! 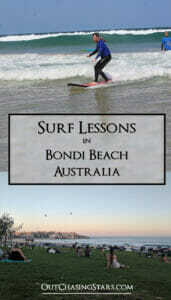 What trip to Bondi Beach would be complete without surfing? 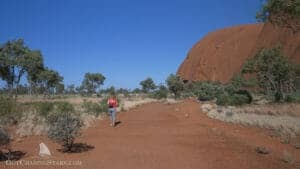 While trying to sort out flights for this whole 6-week Australia trip, it seemed impossible to get to Uluru or Alice Springs direct from anywhere, except Sydney. We’d already spent a few weeks in Sydney in an few amazing anchorages, celebrating New Year’s Eve, and having a fancy day out celebrating my in-laws’ anniversary. There were a few things we hadn’t done: namely checking out Bondi beach. 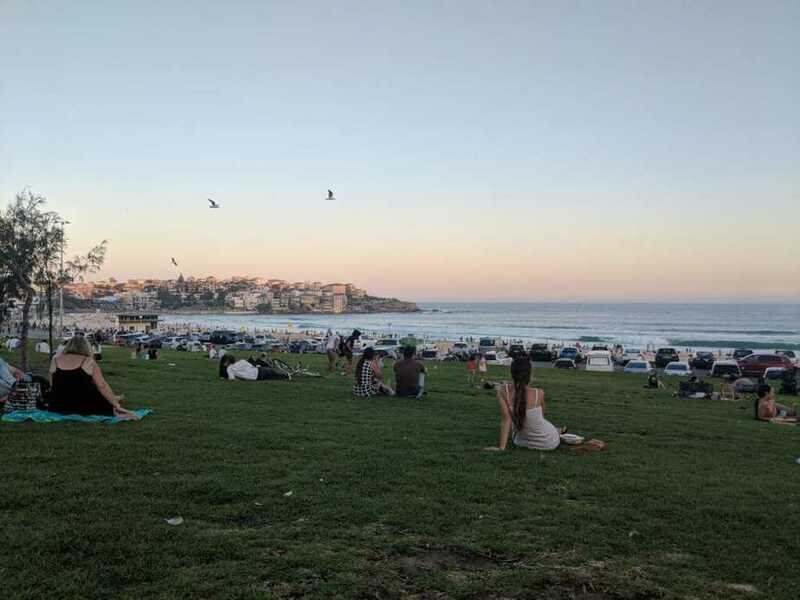 So we extended our layover in Sydney to three nights, expecting to accomplish two things: surf the famous Bondi beach and do the Bondi to Coogee walk. Our last few days in Tasmania David picked up a flu or cold, so he wasn’t up for doing much physically. 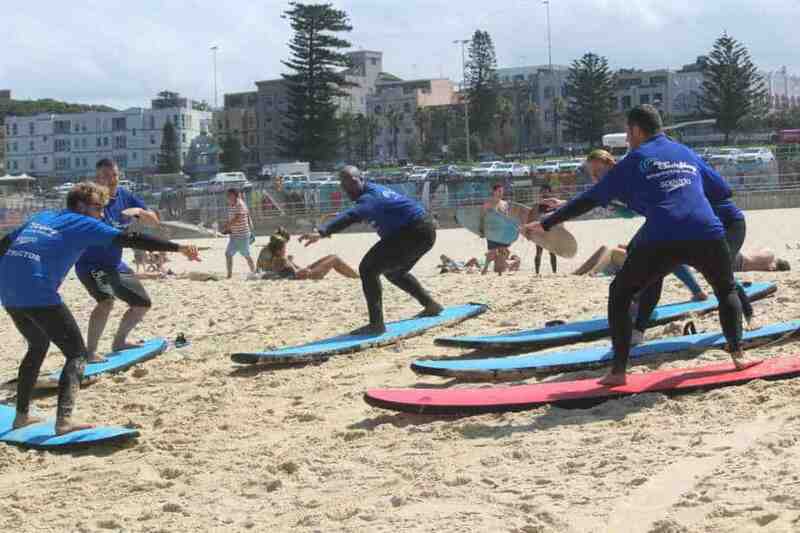 We nixed the long walk, but we had already paid for a surf lesson with Let’s Go Surfing in Bondi. David rallied and toughed the lessons out, and man are we glad we did! Off to the Red Centre! 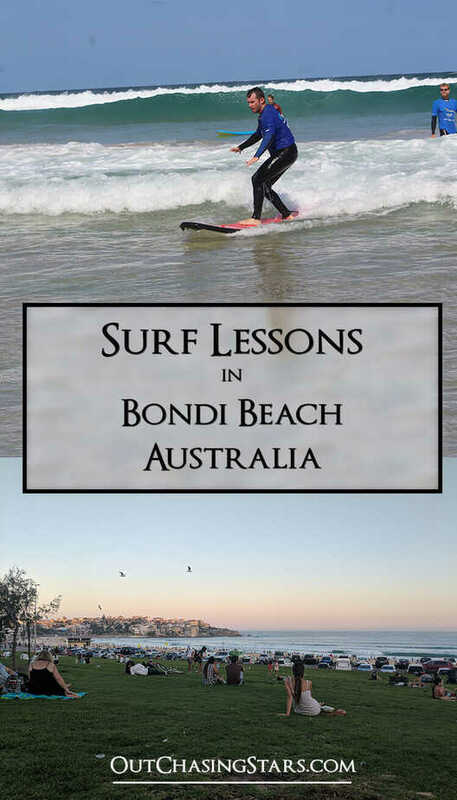 Neither of us have surfed before, so in order to surf the famous Bondi beach, we signed up for a one-time, two-hour beginner’s class. 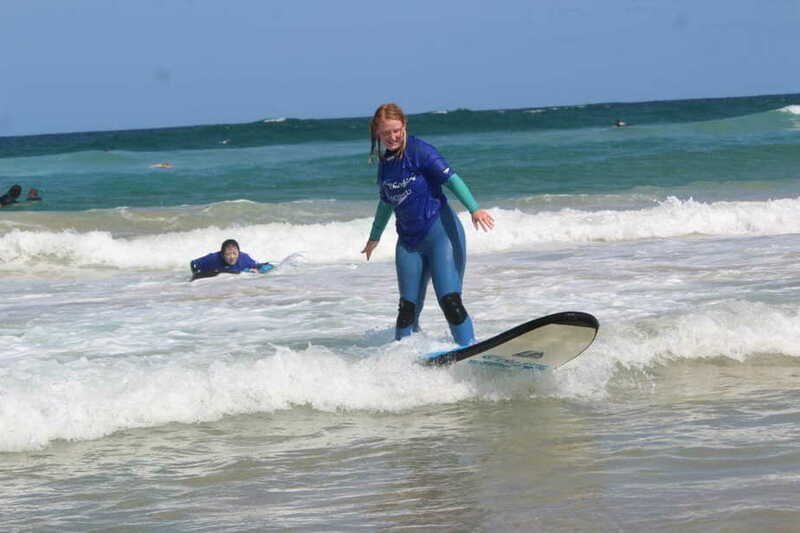 It’s easy to pick Let’s Go Surfing for a class; they’re right on the beach and have an average of 5 stars on 481 reviews on TripAdvisor. Let’s Go Surfing schedules their classes around low tide. Low tide is the best time for beginner surfers! Our class had 10 students in it, none of whom had surfing experience before. The instructors split us up into two groups. We grabbed our boards, and headed down to the beach. Australian beaches have designated swimming areas, demarcated by flags, where the current isn’t very strong. Avoid surfing in these areas to not whack swimmers! Of course, there’s the obligatory posing on the surfboard on the beach. You have to get your technique right before you can just jump in the water! It’s pretty easy to equate surfing to yoga. You need to have good balance to do it, and proper positioning. The instructors taught us to go from a plank to updog to a downward dog to the surf pose, which is pretty close to warrior one. The HARDEST part was not going from downward dog to your knees. For some unknown reason I always wanted to drop to my knees at this stage. 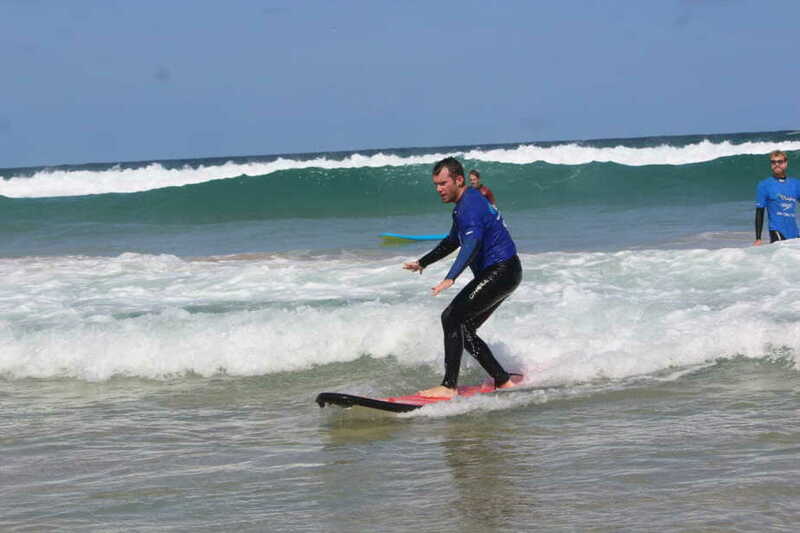 Our instructors assured us that most of the class does, in fact, get up on their boards. And we did! David and I stood on our boards multiple times and surfed in to the shallows. That doesn’t mean we were injury free. My first fall my board whacked me in the face. I was surprised not to have a bloody nose when I popped up. I still have a fading bruise on my left hip from hitting the beach. Updog, or as the surf instructors called it….seal pup! David being a seal pup. The hardest part was getting out into the waves. It is important to turn sideways to the waves. Otherwise I’d get pushed back or knocked over, negating my progress (these hips don’t lie). Walking out into the waves is what exhausted us, not the actual surfing itself. 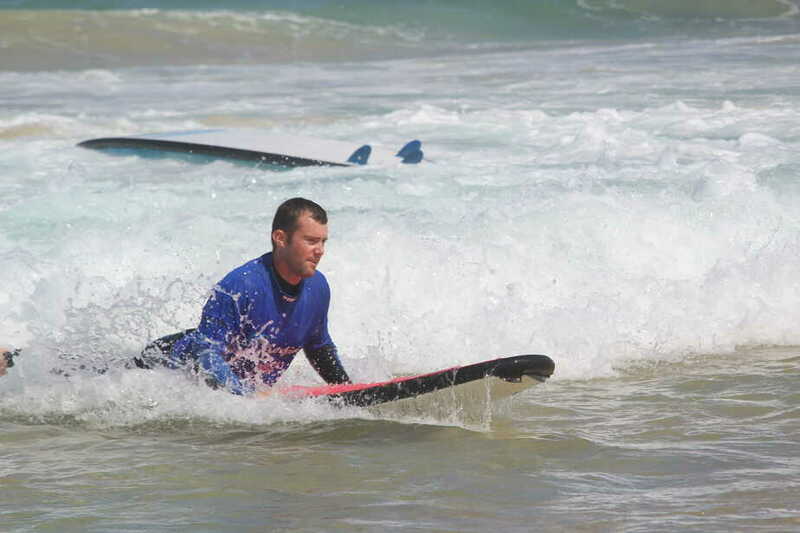 Surprisingly, once you catch a wave you have a lot more time than you would think to get in position. As long as you stay balanced from side to side, you’ll be able to surf all the way to the beach in any of the poses. It is a lot more fun if you can make it all the way to the sand and step off the board! David’s got the pose down! Riding the end of a wave. Let’s Go Surfing has a photographer at most of their classes, and we bought all of our photos afterwards. Pics or it didn’t happen! Now, just to be clear, David and I are not going to run out and buy surf boards for Starry Horizons. We might take another class or two before we leave Australia, but I doubt we will add surf boards to our toy collection any time soon. Ice cream treat after surfing. We earned it. A Sydneysider recommended Hurricane’s in Bondi for ribs. Being from the South, we know good ribs. 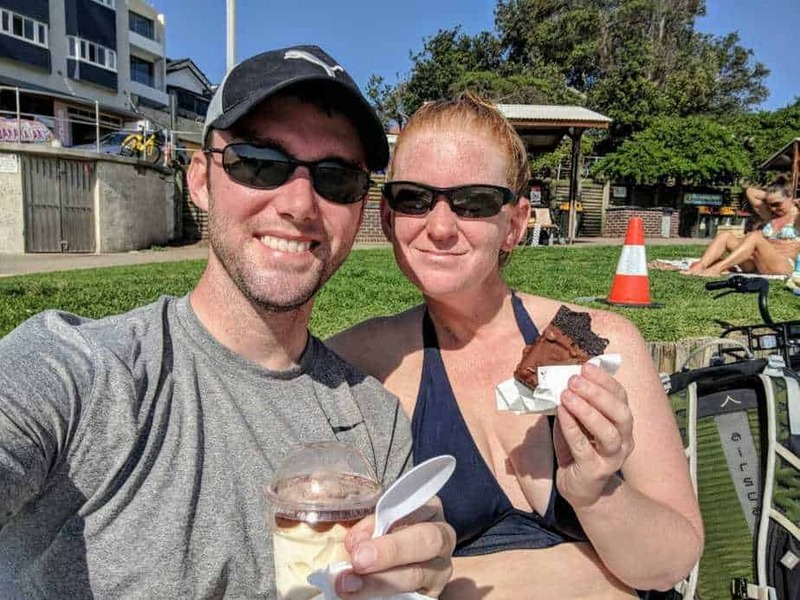 The ribs are Hurricane’s were good, and I can believe it’s hard to find GREAT ribs in Australia. They weren’t the best ribs we’d ever had, but pretty decent. However, after our rib dinner on Saturday night we walked along Bondi beach and EVERYONE was out enjoying the sunset. It made for great people watching, sitting on the grass and enjoying the perfect temperature. We had a small meetup at the Coogee Pavillion. We had great pizza and smoothies. Afterwards, we walked the length of the beach, which was full, seeing as how it was a Saturday. Thank goodness David was feeling better, because we took off for a flight to the Red Centre.